Mike Ullery | Civitas Media Covington’s Brandon Magee edges out Houston’s Zach McKee in the boys 4x100 meter relay Saturday. Mike Ullery | Civitas Media Covington’s Carly Shell crosses the finish line for a second-place finish in the 1,600 Saturday. Mike Ullery | Civitas Media Miami East’s Marie Ewing reacts to winning the 800 during Saturday’s Division III district meet at Milton-Union. 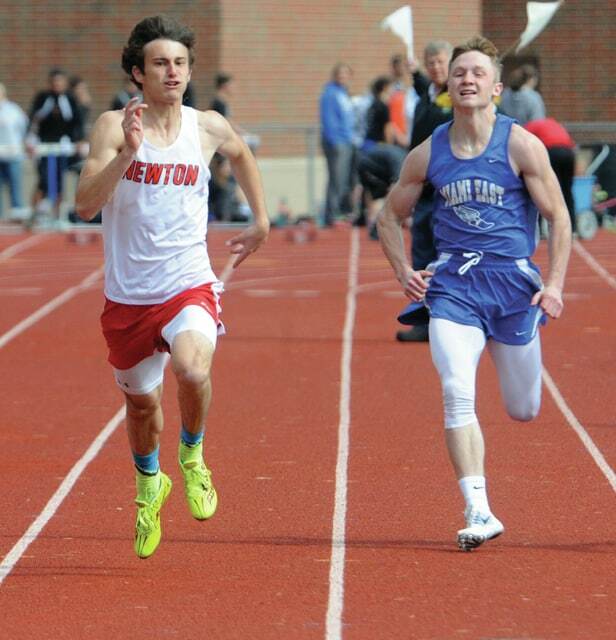 Mike Ullery | Civitas Media Newton’s Jack Yoder and Miami East’s Logan May compete in the 100 Saturday. 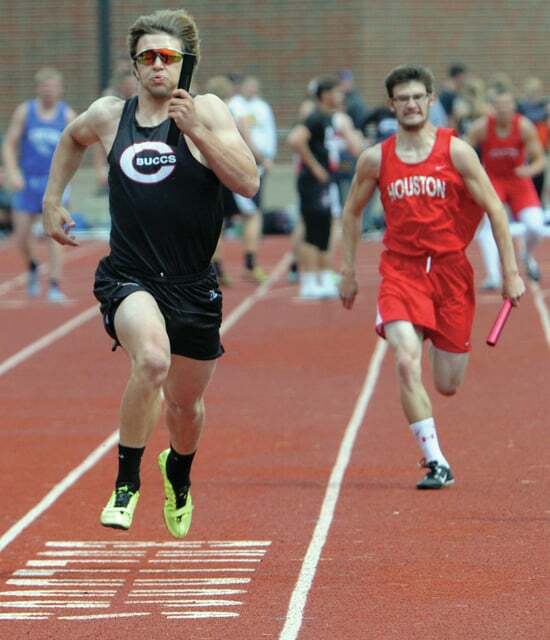 WEST MILTON — It was fitting that Miami East boys and Covington girls were crowned team champions at the Division III district meet at Milton-Union High School Saturday. Because both are the definition of a team. Devyn Carson was the lone first place finisher for East boys, while Covington won the title without a first place finish. Miami East’s boys finished with 85 points and Emmanuel Christian was second with 79. And there was no point where Karnehm didn’t know where his team stood en route to their first district title since 1970, when Karnehm was on the team. “I was keeping score,” Karnehm said with a laugh, pointing to a sheet full of numbers. And in true team fashion, one individual not going to regionals stood out for Karnehm. After hugging his coach, Carson — who had won the long jump by soaring 20-1 1-2 Tuesday — was happy to carry the championship trophy. The Vikings have a big group of regional qualifiers as well. Along with Carson’s win in the long jump Tuesday with a distance of 20-1 1-2; finishing second were Daniel Everett, discus, 140-9; and the 3,200 relay (Bryce Redick, Luke Mengos, Greg Austerman, Gavin Horn), 8:31.18. Taking third were Justin Brown, long jump, 19-0 1-4; Trey Rush, pole vault, 12-6; the 400 relay (Colton Weldy, Logan May, Brown, Jordan Crawford), 46.63; and the 800 relay (Crawford, Brown, Weldy, Carson), 1:36.0. Finishing fourth was Horn, 1,600, 4:39.06. Covington boys finished fifth in the team standings. Winning for the Buccs was Jett Murphy in the pole vault on Tuesday with a school-record tying 14-0; and the 400 relay (Shane Straw, Ethan Herron, Murphy, Brandon Magee), 45.69. Finishing third were Cade Harshbarger, 110 hurdles, 15.71 and 300 hurdles, 43.03; Zane Barnes, 400, 53.19; and the 1,600 relay (Barnes, Magee, Jayce Pond, Nathan Lyle), 3:35.44. Taking fourth were Zach Parrett, high jump, 5-10; and the 800 relay (Pond, Cade Harshbarger, Lyle, Magee), 1:36.40. Brady McBride led Newton boys to an eighth-place finish, while the girls were 15th. McBride won the 3,200, 10:02.09; and finished third in the 1,600, 4:35.97. The 400 relay (Moustafa Simpara, Treyton Lavy, Nick Hoover, Jack Yoder) was second, 46.21; while Yoder was second in the 200, 23.44; and third in the 100, 11.43. Bradford’s boys were 13th. Rhyan Turner led the Railroaders, finishing fourth in the 110 hurdles, 16.02; and 300 hurdles, 43.04. Also advancing was the 1,600 relay (Turner, Zach Miller, Kyle Mills, Kurt Hoover), 3:36.88. The Covington girls finished with 90 points, while Russia was second with 83.5 points. It was the Buccs’ first district team title since 1982. “It really was a team effort,” Covington coach Dave Tobias said. “It was our goal coming in. It has been awhile since we have won district (as a team). It has to have been before I was here. We have some strong veteran runners and strong group of young runners. Senior Carly Shell was one of many who contributed in multiple events. Covington has a strong group of regional qualifiers. Taking third were Horner, 400, 60.58; and Lauren Hebert, shot put, 36-4 1-2. Finishing fourth were Kimmel, 200, 26.80; Lillian Hamilton, high jump, 4-10; and the 1,600 relay (Horner, Lyle, Plessinger, Kimmel), 4:14.28. Marie Ewing led the Miami East girls, using a big kick to run a blazing 2:17.71 in the 800 and edge Grace York of Russia at the finish in and help the Lady Vikings tie Russia for third with 73 points. Taking second was Megan Kinnison, discus, 123-10. Taking fourth were the 800 relay (Wesco, Ashlyn Monnin, Miller, Emma Monnin), 1:51.40; and the 3,200 relay (Lindsey Yingst, Lorenza Savini, Kaitlyn Mack, Marie Ewing), 9:57.87. Bradford girls finished 12th. 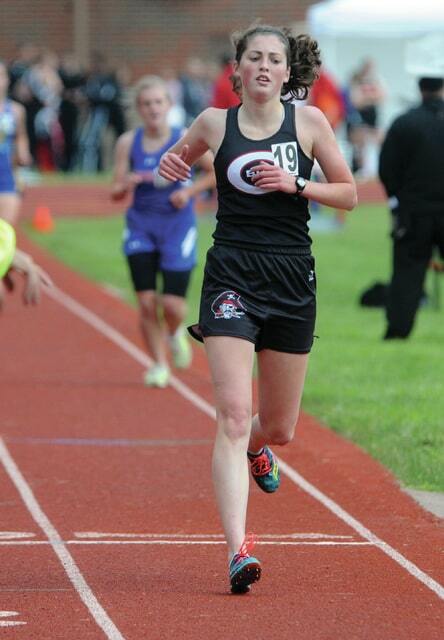 Karmen Knepp led the Railroaders, finishing fourth in the 3,200, 11:49.56 to advance. DAYTON — Bethel’s Korry Hamlin won a pair of individual district championships Saturday at the second day of the Division III district meet at Welcome Stadium, qualifying for next week’s regional tournament. Hamlin won both the 1,600 (4:41.63) and 3,200 (10:23.23) to advance to the regional as the Bees’ boys finished 10th overall at the meet. He will be joined by Bailey McCabe on the girls’ side, who placed fourth in the high jump on Wednesday. Bethel’s girls finished 16th in the team standings. ST. PARIS — The Tippecanoe girls finished second as a team at the Division II district meet Saturday at Graham High School, scoring 89.5 points to Carroll’s 97.5. The Red Devils’ distance runners added a host of qualifiers to their 4×800 relay team’s win on Thursday. Kaili Titley won the 800 (2:20.23) and Makenzie Dietz was third (2:25.52), Abbi Halsey won the 3,200 (11:50.11) and Katie Taylor was second in the 1,600 (5:21.09). The 4×400 team of Dietz, Titley, Taylor Prall and Sammie Rowland also won (4:09.42), the 4×200 team of Prall, Rowland, Tori Livesay and Lunden Mason was second (1:50.97), Prall was second in the 100 hurdles (15.95 seconds) and Jackie Bashore qualified in the pole vault, finishing fourth (8-0) and winning a jump-off to get to the regional. Milton-Union’s girls were ninth with 30 points. Beyonce Bobbitt, who also qualified in the shot put on Thursday, set a new meet record in the discus and won (136-11), and Sarah Motz placed third in the pole vault (8-0). The Bulldogs’ boys were 13th with 18 points, sending two qualifiers on to the regional. Blake Smith finished third in the 300 hurdles (41.57 seconds) and Shannon Milnickel was fourth in the 1,600 (4:37.1). Rob Kiser can be reached at (937) 451-3334. Mike Ullery | Civitas Media Covington’s Brandon Magee edges out Houston’s Zach McKee in the boys 4×100 meter relay Saturday. https://www.tdn-net.com/wp-content/uploads/sites/21/2016/05/web1_052116mju_track_cov_brandonmagee.jpgMike Ullery | Civitas Media Covington’s Brandon Magee edges out Houston’s Zach McKee in the boys 4×100 meter relay Saturday. https://www.tdn-net.com/wp-content/uploads/sites/21/2016/05/web1_052116mju_track_cov_carlyshell.jpgMike Ullery | Civitas Media Covington’s Carly Shell crosses the finish line for a second-place finish in the 1,600 Saturday. 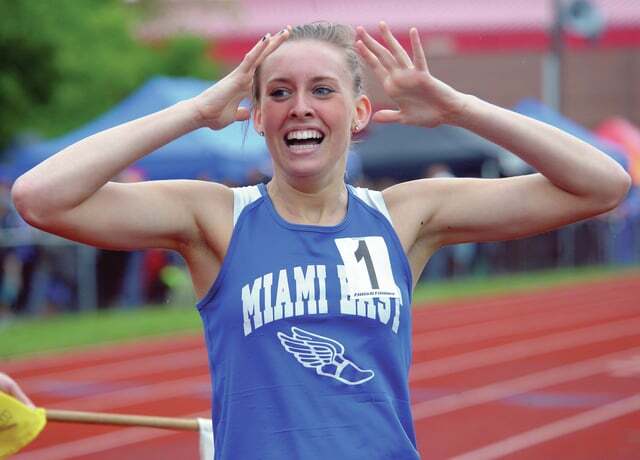 https://www.tdn-net.com/wp-content/uploads/sites/21/2016/05/web1_052116mju_track_mehs_marieewing2.jpgMike Ullery | Civitas Media Miami East’s Marie Ewing reacts to winning the 800 during Saturday’s Division III district meet at Milton-Union. https://www.tdn-net.com/wp-content/uploads/sites/21/2016/05/web1_052116mju_track_nhs_jackyoder.jpgMike Ullery | Civitas Media Newton’s Jack Yoder and Miami East’s Logan May compete in the 100 Saturday.